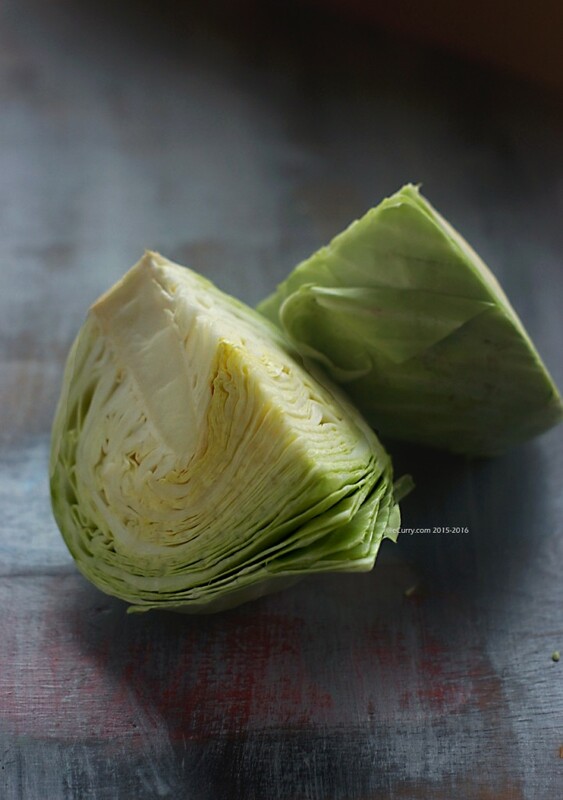 If you are looking for a simple side dish with a meal, consider cooking cabbage with spices. 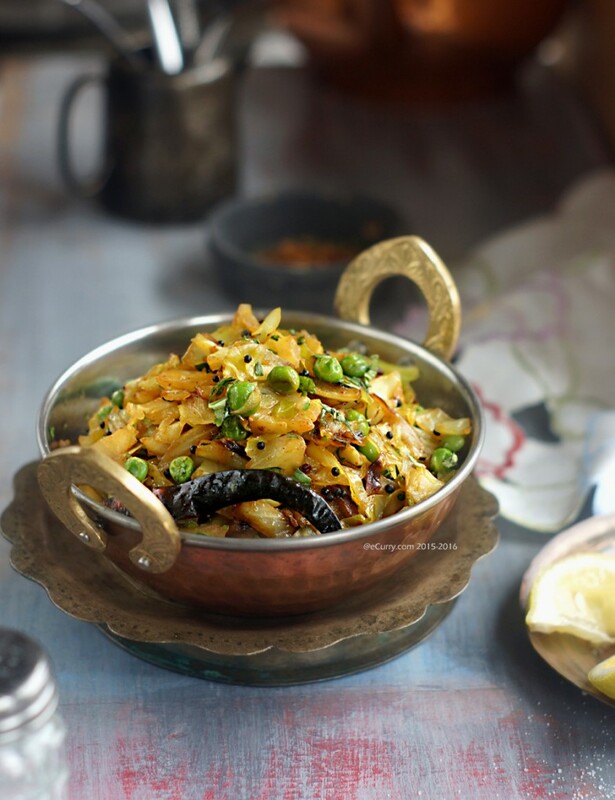 The subtly laced flavors of fenugreek seeds transform this often shunned vegetable into a wholesome, nourishing bowlful. This is my mum in law’s recipe. I have been making this for many years now. The ease and convenience is what I love in this one. 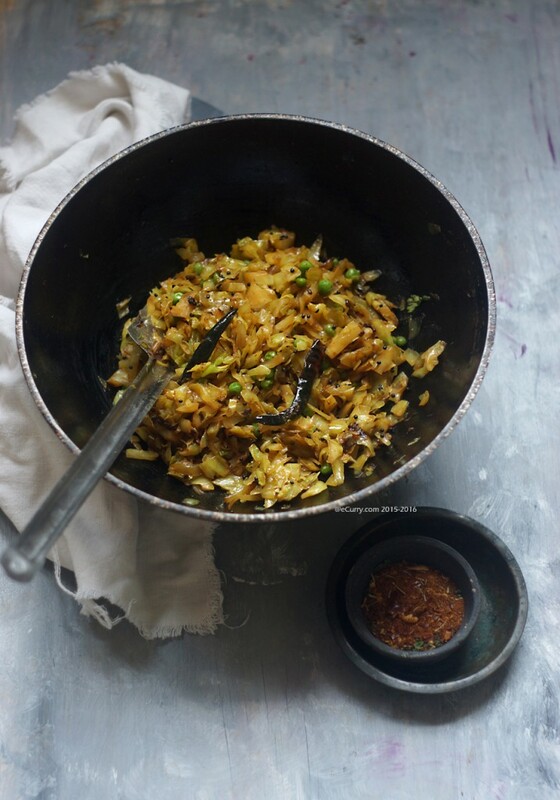 When I was first introduced to it twenty some years ago, I found the flavors intriguing and quite different that I was used to: which happens to be cabbage cooked with garam masala and ginger and also with fish head! This one soon became a fast favorite in our household. 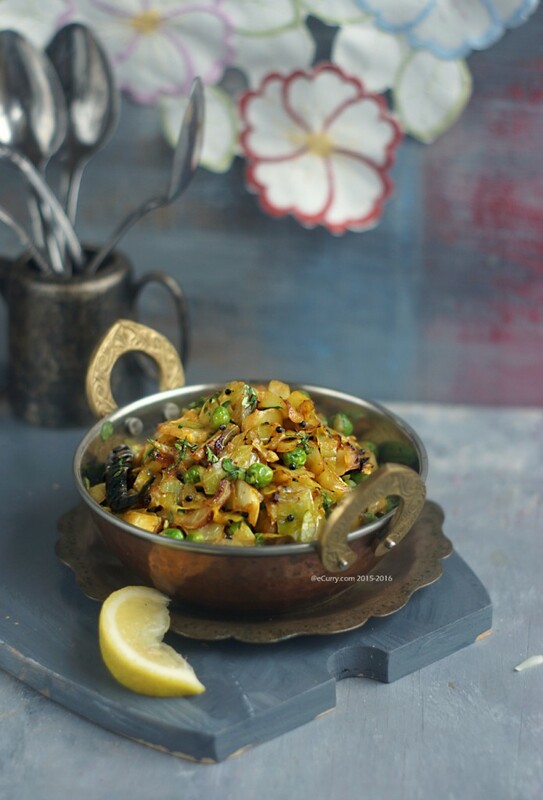 The fenugreek adds a slightly pungent yet sweet flavor to the dish. A part of my mum in law belongs to the state of Gujarat. 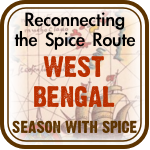 The flavors of cooking in that state, hugging the western coast of India are basic and simple. The population being mostly vegetarian, there are many unique dishes that belong to this state. Besides being vegetarian, the cooking is often satvic in nature, which means onion or garlic is not used in either. 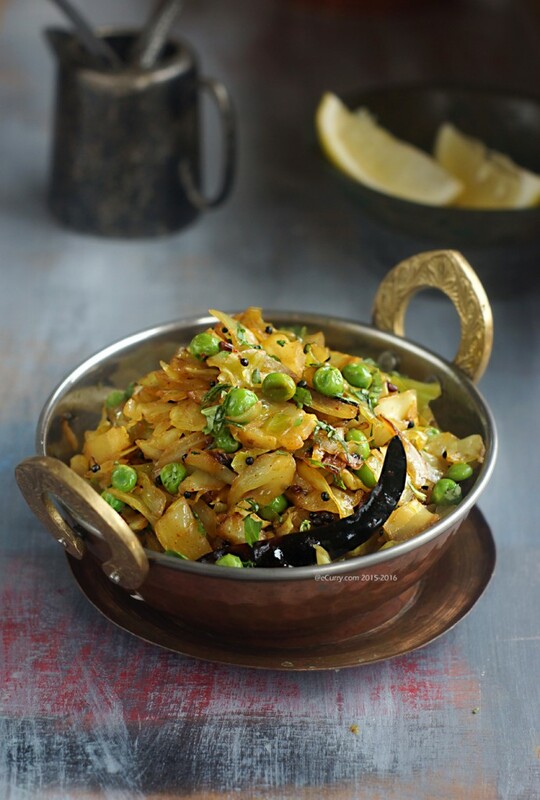 This simple dish with a hint of fenugreek and mustard, cooked just enough to soften the cabbage and retain the bite at the same time, may bear similarity to the popular Gujarati “kobi no sambharo“, or it could be that mentioned dish with adaptation of my mum in law and then mine. 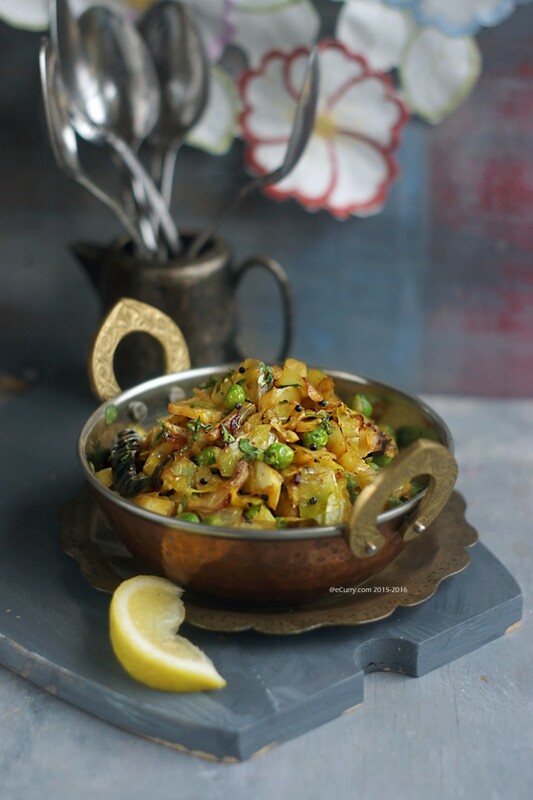 “Sambharo“, as I have understood, can be categorized as a salad, or a simple and quite saute of vegetables or a combination of vegetables with light spices. They are usually used as a side dish to a meal. The addition of asafoetida/hing and the peas are my own adaptations. The children like the peas. 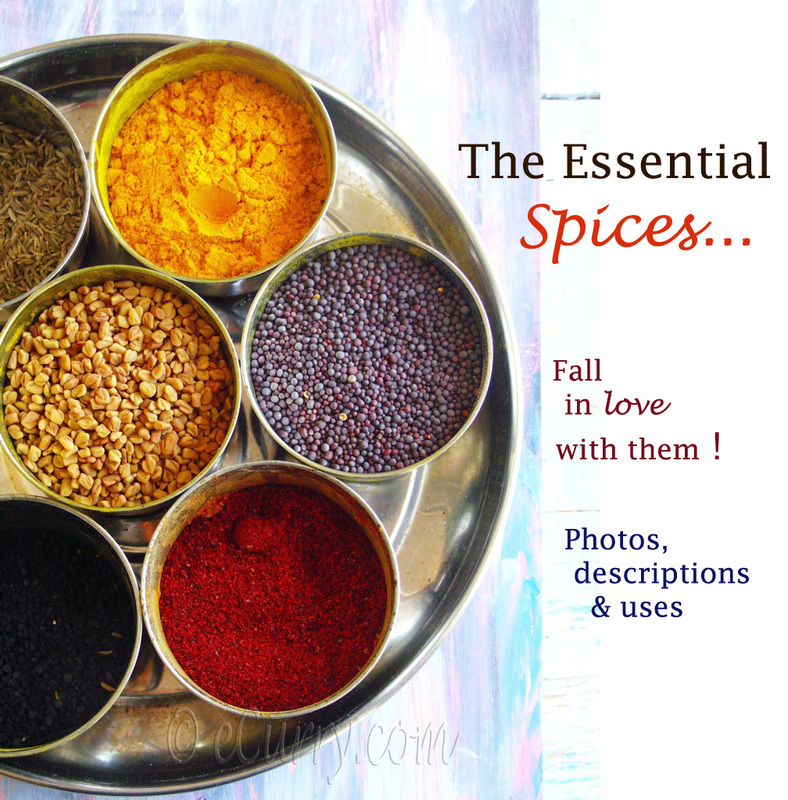 The hing/asafoetida adds a subtle fragrance, which to me is a must in “satvic” food. Finely shred the cabbage. Or finely chop the leaves. Please make sure that they are not too big, or else they take longer to cook and also do not merge with the spices too well. Wash and drain. Heat oil in a wok or a pan. Add the dry red chilli peppers. 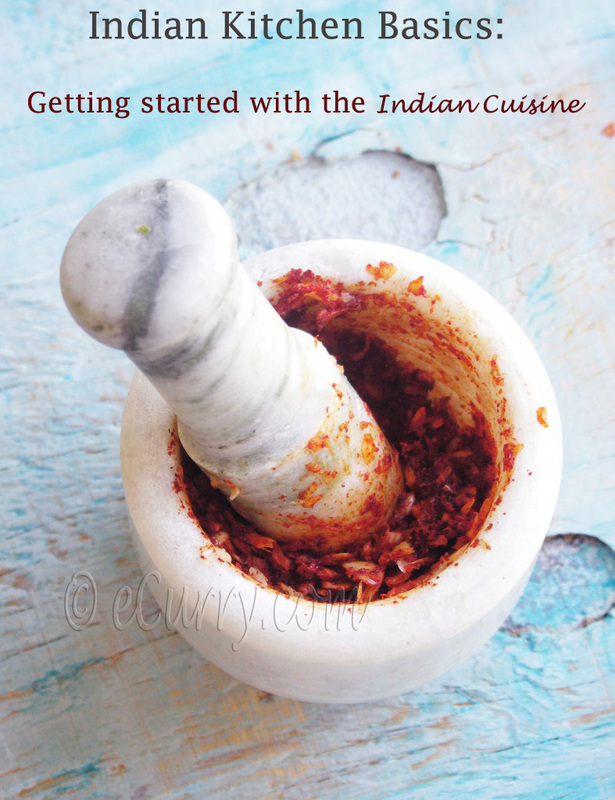 Once they turn dark brown, add the hing/asafoetida, mustard seeds and the fenugreek seeds. When the mustard starts to pop, add the shredded cabbage, salt and turmeric. Toss well for the leaves to be coated with the spiced oil, salt and turmeric. Turn down the heat to medium and cook uncovered tossing frequently so the leaves start to glisten with the oil, about 5 minutes. At this point lower the heat and partially cover the wok or pan and allow the cabbage to cook until softened (but still retains a bite) and reduced in amount. Stir the leaves once in a while. 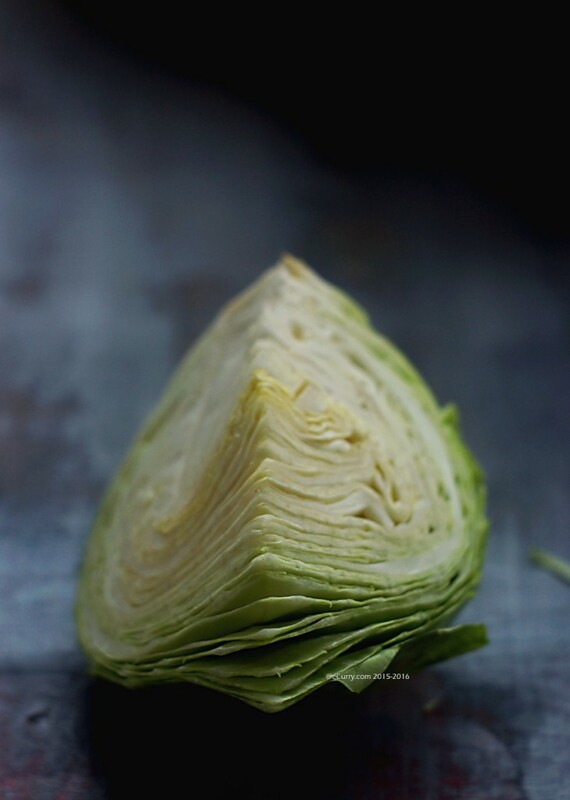 If you have a good young cabbage it should get cooked in 12 minutes. 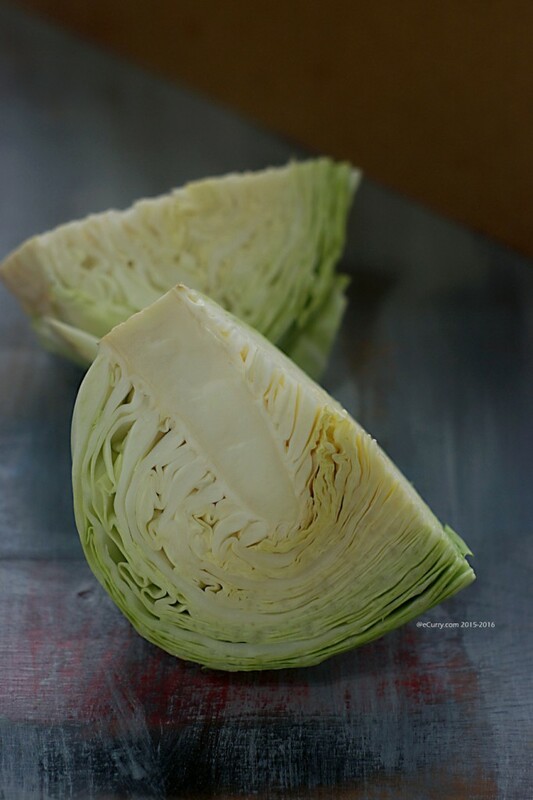 (The time it takes the cabbage to soften will depend on the vegetable itself. So adjust time accordingly). Uncover and check if done. If done, add the peas, increase the heat to medium, toss frequently and cook for about 5 minutes. Give it a final toss, increase the heat to high and cook for about a minute or two (you will see the edges turning brown) and remove from heat. This is a dry dish: there will be no water/liquid in the dish. Adjust salt. Garnish with fresh cilantro/coriander and lemon juice if you want. 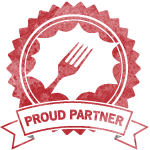 March 17th, 2015 | Category: Dry Fries, Sides & etc. Love this combination and such an easy and delicious side dish. I will certainly have to try this one. 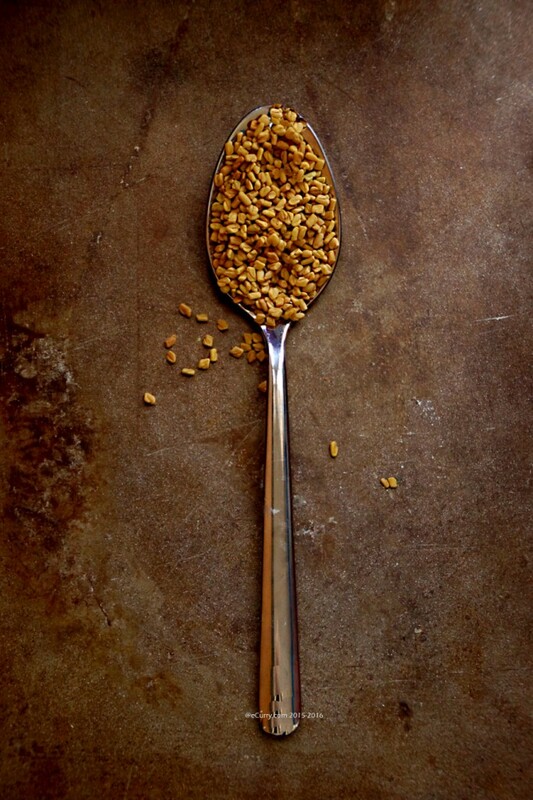 Fenugreek is one of my favorites. My fenugreek seeds look just like yours, so I know they are what they were sold to me as. But they are as hard as a rock, literally. I don’t see how you could bite into one without breaking a tooth. I even tried soaking them overnight in water and they don’t get soft. I have therefore been grinding mine into a coarse grind. Curious about how you deal with this issue. That is how they are supposed to be. Hard as a rock. It is the flavor and medicinal properties that helps and the reason they are used for tempering dishes. You will smell that instant aroma once it hits the oil/ghee. Since it is used in very little amount and probably softens while cooking, it does not interfere. If you have ground them it is okay. If you soak them they do get soft and even germinate, the sprouts of these can be planted for fresh green leaves. The soaked softened seeds can also be cooked. Yum, I love the sound of this dish. Simple and tasty. Thank you for the info on the seeds…I too have been a little confused about how to use them. 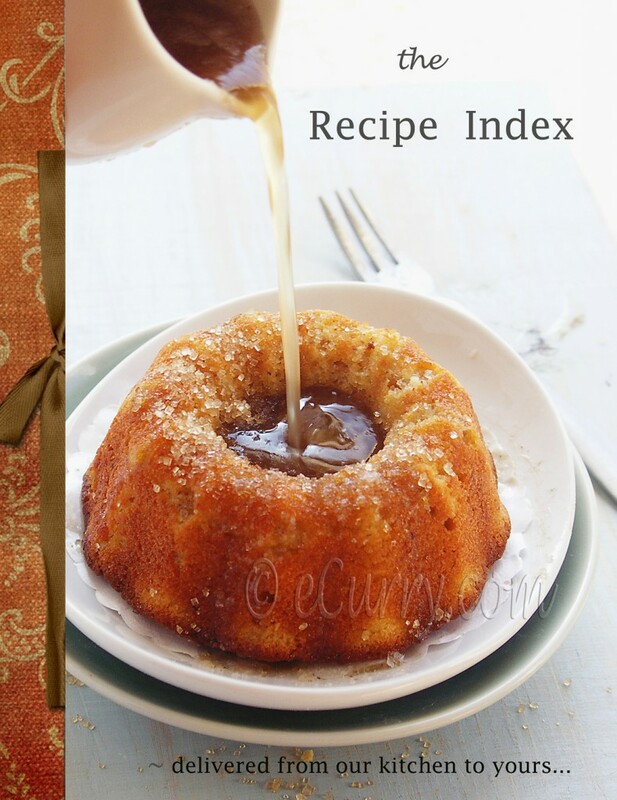 You have inspired me to try again this weekend…beautiful recipe and photo! Grazie, lovely recipe and beautifully photographed! I do not think there can be substitute for fenugreek. It has a typical flavor. Just skip it and use the rest of the spices. For someone who’s not fond of cabbage it takes a lot to say yours looks appetizing! Spring is the only time I like to use cabbage because of the young heads. I will try your recipe later this week. Yesterday I concocted young cabbage and black kale in mustard paste – a recipe that still requires refinement!